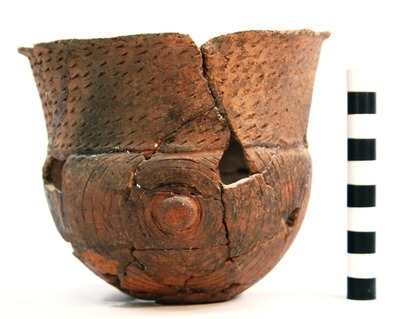 "41CS25, X-6, unknown context" by Timothy K. Perttula and Robert Z. Selden Jr.
DECORATION (INCLUDING MOTIF AND ELEMENTS WHEN APPARENT): The rim of the vessel is decorated with 10 horizontal rows of diagonal tool punctations. The vessel body has three sets of concentric incised circles around large (14.6 mm in diameter) and flattened appliqued nodes. Foster Trailed-Incised, var. unspecified jar (Vessel No. X-6) in an unknown context at the Clements site.